Many ammunition manufacturers know how to follow success, but few actually know how to lead them. 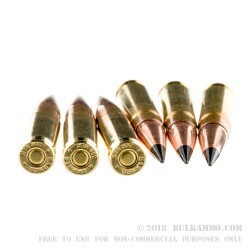 The Barnes 110gr .300 AAC Blackout TAC-TX is one round that understands what it means to lead. 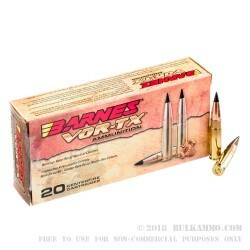 At 110gr, the Barnes .300 AAC Blackout TAC-TX has an average muzzle velocity of 2,350 feet per second, and is ideal for hunters who are looking for more power than what the standard .223 round can offer. 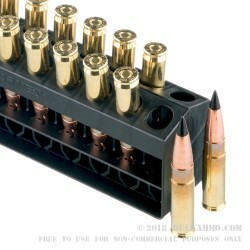 Since Barnes .300 AAC Blackout ammo is capable for fitting in the same magazines, bolt carriers, and lower receivers as .223 ammunition, hunters now have the means of sharing equipment equipment across .223 and .300 weapon system, now utilizing the added power of a .30 caliber round. Polymer tips increase the inherent stability and aid in the expansion of the round upon impact out to a staggering .603 inches in diameter. 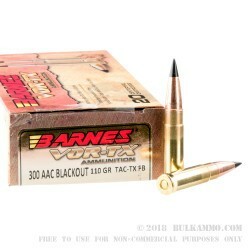 When hunters around the country need greater performance for greater prey, you better believe they turn to the Barnes .300 ACC Blackout VOR-TX for answers.